Killer Wireless-AC high-performance networking adapters deliver stunning speed, increased intelligence, and amazing control. 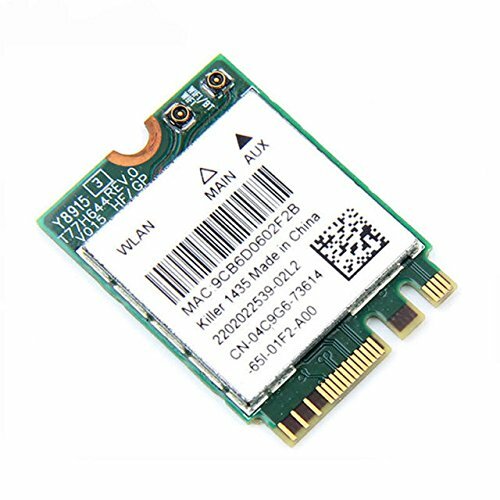 The Killer Wireless-AC 1435 is a 2x2 11ac adapter with Bluetooth 4.1 that supports 802.11ac Wave 2 features including support for MU-MIMO and Transmit Beamforming. The Killer Wireless-AC 1435 features Advanced Stream Detect 2.0 Technology, which delivers high-performance networking along with industry leading intelligence and control. With this technology, Killer 1435 automatically classifies and prioritizes critical network traffic for online games, HD video, and high-quality audio to ensure a smooth and enjoyable gaming and entertainment experience. With this cutting edge technology, the Killer Wireless-AC 1435 outperforms competing wireless adapters by improving latency, reducing jitter, and virtually eliminating video freezes. Killer Wireless-AC adapters support dual bands (2.4 GHz and 5GHz), IEEE standards-based 802.11a/b/g/n/ac, 256 QAM Modulation, and Bluetooth connectivity. Killer Wireless-AC 1435 delivers industry-leading data rates up to 867 Mbps and includes full MU-MIMO and Transmit Beamforming support. Delivers industry-leading data rates up to 867Mbps. Full MU-MIMO and Transmit Beamforming support.